This is the third and final excerpt from Paraffin Chronicles about the first year the Wind an Sea Surf Club went to the Makaha International Surfing Championships. The Characters in this story are all in their 60s and above, and those who are still alive are still part of the surfing brotherhood that was formed some 50 years ago. Long live Wind an Sea. The next day they planned to run the men's division. It was huge. Twenty-foot Makaha Point Surf, what a sight to see. We all climbed up the judges towers to get a view. Oh man, it was scary. That point I mentioned, Clausmeyers, it had morphed into what they call a cloud break, because the waves break out so far they look like clouds. We heard that Phil Edwards had lost his board on a big wave and that it had drifted all the way out to Clausmeyers and broken in half. Phil was out. The one guy who really ripped that day was Mickey Munoz. He caught some huge waves. Joey Cabell was good, too. They both surfed for Wind-an-Sea, and Joey ended up winning the men's division. 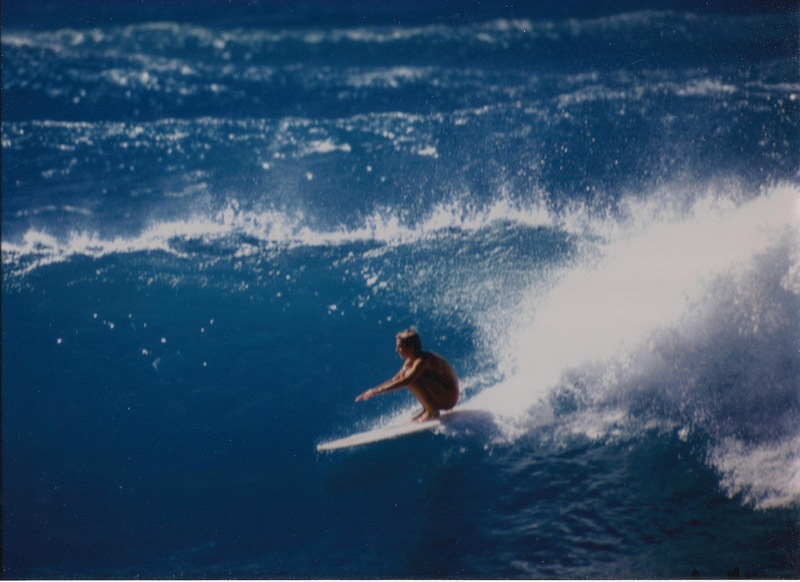 The junior final was held days later in smaller surf, the kind we all would have loved, and Fred Hemmings won. The day after the contest, they bused us all into town and we got to surf Waikiki. It was wintertime, of course, and there wasn't much surf. But we had a great time just being on hallowed ground. Diamond Head reaching up to a dark blue sky. Clear, warm water. The hotels lining the beach. We were charged and ended up paddling all the way out to Number Threes, just for the fun of it. It didn't take much to make us happy, and the occasional three-footer that came through would be attacked by a dozen whip-cut gremmies with red trunks. Herb Torrens at Mailie, 1964. Photo by LeRoy Grannis. That night, a famous local photographer, Clarence Maki, had a party for us at his house and Duke Kamanamoku was there. I'm assuming you know who the Duke was. If not, let me just say that he was a Hawaiian legend. Make that surfing legend. Oh hell, he was legend of legends. I mean it. He helped introduce surfing to California in the first part of the 20th Century. He won Gold Medals for swimming in the Olympics. He made movies with Johnny Weissmuller, who also was a Gold Medal Olympic swimmer and played Tarzan. The Duke. One of a kind. Real man. Real surfer. Anyway, there we all were with the Duke himself holding court. Great party. Hawaiian style. There was kalua pig and lome lome salmon and poi. And, we all got to wear lava lavas. You know, those little wrap-around skirts. Okay, they made us wear them. Clarence took our pictures with Duke, a couple of which made it back home to appear in the local newspapers. Pretty cool. I remember Duke being very soft spoken and humble in a way. Yet, he had an aura of royalty. The look in his eyes when he smiled, the smooth texture of his voice, his wavy white hair, the Duke was an icon and we were all honored to be in his presence. A couple of days later, we got to go to the North Shore. Thor rented two vans to take us there with our boards. We were charged, but when we came over the top of the hill and caught our first glimpse of Haleiwa, our excitement turned to shock. It was closed-out. Meaning, the waves were breaking out so far that none of the regular spots would be rideable. A huge north swell on a blustery side-wind-type day. Pete Johnson told us the only place we would be able to get in the water was, you guessed it, Waimea Bay. Oh man, I already had enough of big surf. Of course, that's where Petey Johnson had made his name. So it looked like we might all be talked into going out there. We looked at Haleiwa first. No way. It was closed out, and outside there was this big cloud break they called Avalanche. Yeah, they surf it now, but this was before jet skis, and cords. You had to be crazy to go out there. Maybe you still do. We made our way out to Waimea and were kind of surprised to find a sort of peaceful little bay with just a few waves breaking off the point. It didn't look so bad, at first. A closer look showed a horrendous shorebreak, which meant the waves outside were bigger than they looked. Much bigger. We hiked out on to the point and gathered at a spot where we could see the outside waves. There was no one out, so it was hard to tell how big they were. Petey said they were 15-plus, but then someone said no way. An argument broke out with Petey getting really mad. We must have been arguing for about 15 minutes out there when some one suddenly jumped up and said there was a guy paddling out. A set came wrapping around the point and we strained our eyes for a glimpse of the lone surfer braving Waimea. We saw him paddle up a wave that had to be four or five times overhead. Then someone said, "Hey, that's Strada!" Strada? We looked at each other. Larry Strada had been with us when we started the argument about the waves, then he just sort of disappeared. So, here's Strada scratching to get out over this set. And we were all jumping up and down. Petey was yelling "I told you so." Luckily Strada made it out without getting caught inside. Then one of the seniors, Mike Burner, grabbed a board and paddled out. We couldn't believe it, Larry Strada paddled out alone at Waimea, and Burner went out to see if he needed any help. Burner got outside and then they both ended up paddling in without catching a wave. I always wondered what they said to each other out there. There was no way anyone else was going out, so we went up the valley to Waimea Falls and jumped off the cliff. It was fun, but man that water was cold. Colder than the mainland water in winter. That afternoon, we were on our way back to Wainai when we saw that the huge surf on the North Shore was also wrapping down the west side of the Island. We stopped at a place called Maili Beach, made famous by Phil Edwards and Mike Hynson in Bruce Brown's "Surfing Hollow Days." It turned out to be the best surf of the entire trip. Perfect four-to six-foot rights with the sun shining through the back of the waves. We surfed until dark. That was what Hawaii was all about. Those two weeks in Hawaii seemed like a lifetime. We all returned to the coast with a different attitude. Some how much older than when we left. We'd seen the big waves, felt the majesty of Hawaii and shared times that none of us would ever forget.